Employ a search engine on the Internet. About.com - (formerly the Mining Company) is not really a search engine, but they provide an excellent directory. AllTheWeb claims that you can "find it all" using their service. Caution : This search site may be blocked by some content filters. AltaVista allows searches for documents in a specific language and provides a topical index. AOL Search is a search engine powered by Excite and enhanced by Google. Dogpile searches by accessing several search engines. If you have been using the search engine MetaFind, you are now automatically routed to Dogpile. FindSounds.com is a search engine for finding sound effects on the Web. Google ranks the quality of sites based on the quality of sites that link to it. Google Custom Search Engine - Create your own search engine on specific topics and limit it to just the web sites you want students to use. HotBot allows you to define the search, narrow the search by time (items posted within the last...), or by domain (.com, .net, .edu...). Internet Public Library - The mission of this site is to provide library services to the Internet community, to learn and teach what librarians have to contribute in a digital environment, to promote librarianship and the importance of libraries, and to share interesting ideas and techniques with other librarians. Librarians Internet Index - searchable, annotated subject directory of more than 6,200 Internet resources selected and evaluated by librarians for their usefulness to users of public libraries. It's meant to be used by both librarians and non-librarians as a reliable and efficient guide to described and evaluated Internet resources. Mamma.com - The Mother of All Search Engines - When you enter a query at the Mamma.com web site, Mamma's powerful proprietary technology simultaneously queries 10 of the major Search Engines and properly formats the words and syntax for each source being probed. Mamma then creates a virtual database, organizes the results into a uniform format and presents them by relevance and source. Partners in Rhyme provides a huge database of sounds to search. Search.com posted by c|net and powered by Excite. Their topical index is in the form of a pull-down menu, or a listing of topics they call Specialty Searches. SortFix - SortFix has developed a system that does all the hard work and leaves you only the easy part. Behind the scene an intelligent algorithm imitates a professional searcher - by scanning and examining the results, it reveals the significant keywords and terms that will help you to define a better question. Give it a try! Thomas - (as in Thomas Jefferson) Legislative Information on the Internet "Acting under the directive of the leadership of the 104th Congress to make Federal legislative information freely available to the Internet public, a Library of Congress team brought the THOMAS World Wide Web system online in January 1995." Visual Thesaurus - Really cool way to look up synonyms. It is just a trial version but you can look up a few words at a time without paying. Webcrawler has a clean new look. No ads, No Banners, No Pop-Ups. Wayback Machine - Browse through 55 billion web pages archived from 1996 to a few months ago. Yahoo features a topical index as well as a search function. The topical index provides pre-defined search results. Zapmeta - I really do like their Quick View feature, give it a try. Although this meta search engine does give a small, manageable number of resources, the first sites listed are commercial sites. Recommendation : Skip the Featured Sponsor Listings and go straight to the Web Site Results section. Search Cube - Search-Cube is a visual search engine that presents web search results in a unique, three-dimensional cube interface. It shows previews of up to ninety-six websites, videos and images. Yippy - Clusters search results so that you can target a particular topic. Ms. Dewey - Interesting visual interface with a "sultry demeanor"
Develop and refine a problem statement. Formulate a research plan that addresses a problem to be solved. Develop an awareness of the limitations to scientific investigations. Compare risks and benefits involved with solving a problem. Demonstrate correct use of scientific instruments. Anticipate safety issues during experimental design. Recognize the value of collaboration and division of labor within a team. 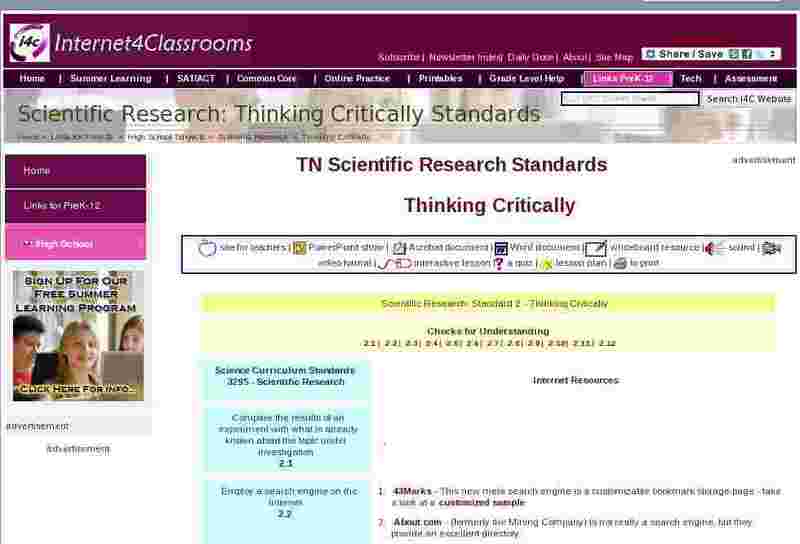 Analyze questions using technology and mathematical models. Use mathematical and computational models to analyze questions derived from the scientific research problem. Write narrative descriptions of observed scientific phenomena.